They say it takes a village to raise a child, here at St. John it takes more than just our religious leaders to keep a congregation afloat. Here’s a glimpse of those behind the scenes working at St. John to keep things moving forward and what all they do within the church. Andy is married to Kate and they have two boys in the Anchorage public school system. Andy is a graduate from UAA (B.S. Biological Sciences) and Sioux Falls Seminary (Master of Divinity). He loves running, skiing, fishing, hunting, foraging for wild berries and mushrooms and basically anything that involves being in the great outdoors of Alaska. Andy came to faith in his young twenties through the loving and patient ministry of the good people of the United Methodist Church of Chugiak. Andy loves the Lord and he loves the people of St John. 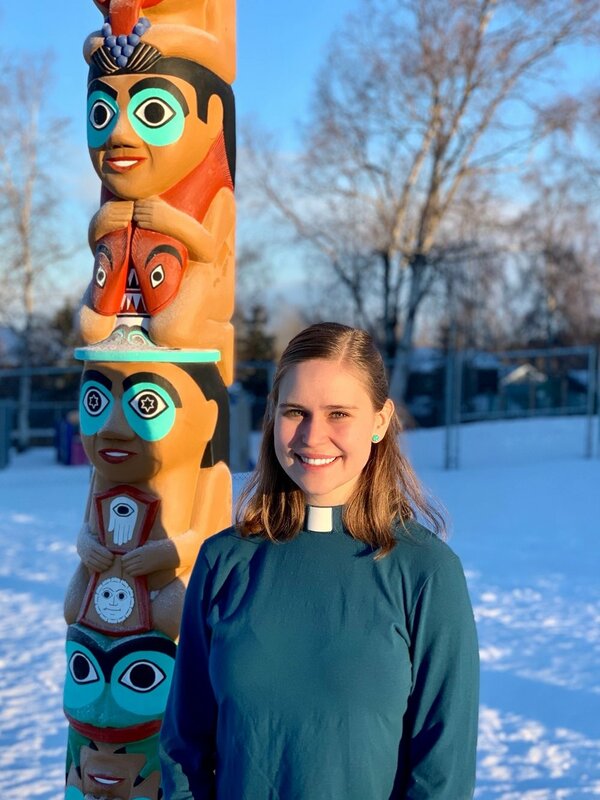 Emily graduated from Candler School of Theology with her Master’s of Divinity degree and was commissioned as a Provisional Elder in the Pacific Northwest Conference in 2018. She began appointment at St. John UMC in the same year, and loves learning in ministry in this place. She has a deep passion for discipleship and justice work that encourage right relationship with God and one another. When she’s not at the church, you can probably find her outside enjoying God’s creation with her husband, Aidan. Robbie plans and organizes youth ministry at St. John, as well as the College Ministry and Young Adults. Before joining the church staff, Robbie was a volunteer youth leader for five years, and coordinator for Mini-Methodists and Children’s Choir. Robbie offers 20 years of childcare experience. Robbie is truly dedicated to leading our youth and has proved to be an incredible resource for those navigating parents and youth alike during the trying years of young adulthood. She and her husband Nick have two daughters, Bailey who attended seminary at Boston University, and Allison who attended school at University of Alaska Fairbanks. As Director of Children’s Ministry, Erynne coordinates, implements and creates programming for children and their families. Prior to this position, Erynne has served on staff at St. John in a variety of ways since 2015.She has a Bachelor of Arts degree in Psychology from UAA. Erynne has enjoyed working with newborns through high school aged children in the classroom, administratively, and as a church volunteer since she was a youth herself. Erynne is a lifelong Methodist who was baptized by her grandfather, Rev. Howard DeVore at St. John in 1986. She has two young daughters and they enjoy hiking, dancing, reading, and eating stale goldfish together. As the Director of New Horizons, Judith coordinates, implements and creates programming for children and their families. “Miss. Judith” was has been known at St. John for years. First joining our staff as the previous Director of Children’s Ministries. Judith also volunteered with St. John's Children’s Ministry 2003-2008. She holds a degree in elementary education. Judith is a life long Methodist - her father is an ordained United Methodist elder and serves at Turnagain UMC. She is a military spouse and has had the opportunity to be an active part of many United Methodist Churches. Judith likes to teach, hike, bike and fish. She and her husband Brent have three daughters, Emily, Elizabeth and Hannah. Staff-Parish Relations is our personnel committee and supervises the pastors, assists the superintendent in times of pastoral changes, gives guidance to the senior staff in their supervision of the administrative and program staff, reviews staffing policies, etc. Finance Team is responsible for the day-to-day financial operations of the church, including creating the annual budget and authorizing special offerings and fundraisers. The Board of Trustees are the legal corporation of the church and responsible for care of the physical plant, insurance matter, building use policies and legal matters. Worship Team assists the pastors in planning worship, weekly and special events, and the care and seasonal decoration of the sanctuary. Congregational Care & Hospitality creates a welcoming space for all guests and members of St. John. They also extend the congregation’s love to our students and military living away from home and sponsor annual events to further community within our congregation. Outreach & Mission works to extend our fellowship through the donation of gifts and time to those in need, from caring to the homeless around Anchorage, partnering with others in the community, to organizing international missions around the world. Discipleship Ministry Team cultivates adult faith formation though [Worship+] classes and small group engagement. Earth Stewardship works with the Trustees to help St. John be a green church. The committee advocates for responsible stewardship of God’s creation in our church, homes and wider community. The LGBTQ+ Outreach Ministry Team extends the congregation’s ministry to the LGBTQ+ community and coordinates opportunities within the church to be welcoming to all persons. Children's Ministry Team works with the Christian Education staff in developing educational and fellowship ministries for our children. They meet monthly, time to be determined.